When laminate wood flooring first came on the market it had plenty of benefits but the appearance wasn't one of them. You could tell upon entering a room that the floor was not solid hardwood. Today's manufacturing techniques have changed that stigma. You could easily walk into a room with laminate wood flooring and never know. It's no wonder laminate wood flooring has become more and more popular with Indianapolis homeowners. Laminate flooring is a wood floor constructed in layers. The bottom layer is the "backing". It's designed to resist moisture that could cause boards to warp. Above the backing is the inner core which is reinforced to further enhance moisture resistance and increase durability. Next is the image design layer - the part that you see. The design layer is a high-resolution image of wood (or other material) and sometimes texture can be added to enhance the realism of the planks. The final layer is a top wear layer to protect the design from scratching, fading and wear and tear. >Learn more about laminate wood floors from wood flooring store Kermans. 1. 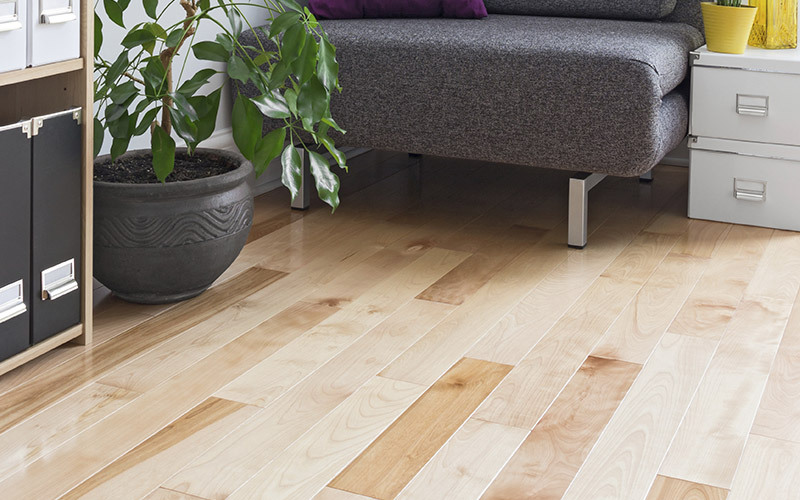 Value: Laminate wood gives you the look of hardwood at a much more affordable price. The installation of laminate wood floors is simpler and costs less as well. 2. Durability: The top layer of the laminate floor makes it one of the longest lasting floors on the market. It won't show traffic patterns like other flooring. It's also moisture resistant making it an option for a wider variety of rooms than traditional hardwood floors. 3. Appearance: The quality of the high-resolution top layer of laminate wood flooring is truly impressive. It mimics any type of hardwood and some manufacturers even add texture to the layer for a more realistic wood plank. Laminate wood flooring is installed in planks further increasing its similarity in appearance to a solid hardwood floor. At Kermans we also offer environmentally friendly laminate wood floors - where the manufacturer uses recycled content to make the floor. And if buying an American-made flooring is on your list of requirements, we have a great selection of laminate wood flooring that fits the bill. Laminate wood flooring is a product that has really impressed us with its look, feel and longevity. Would you like to learn more? Stop by our showroom and we'll be happy to show you some of the many varieties of laminate wood flooring.